Called the "Hostess City of the South," Savannah brings with it the image of lovely girls in white dresses having a sweet iced tea. Face it, you can't even say the name "Savannah" without adding in a slight Southern drawl. Try it. Like most key cities in the South, Savannah is a place to golf, with nearly 20 courses in a city of just 130,000 residents. 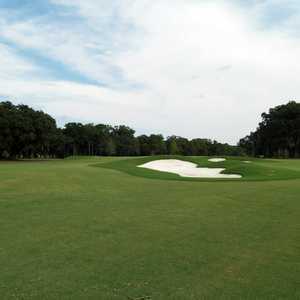 Savannah's golf courses range from the mammoth and extravagant to smaller and more discrete. 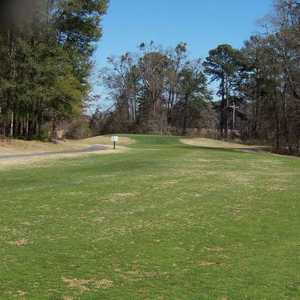 The golf courses: Deer Creek, designed by Tom Fazio; Magnolia , originally designed by Arnold Palmer and Ed Seay; Marshwood, the original course at The Landings Club, designed by Arnold Palmer and Frank Duan; Palmetto and Oak Ridge, both Arthur Hills designs and Plantation, designed by Southern architect Willard Byrd. The Landings Club is a private, gated community, but guests can get on with a member and temporary guest memberships and packages are available, with fees fluctuating from expensive to really expensive. It's a tough call which one would be the best to play should the opportunity arise, but the Deer Creek Course was ranked as one of "America's Best Top 100 Residential Courses," by Golfweek Magazine this year. It's everything you'd expect from a Fazio course, with large bunkers, sculpted mounds, two-tiered fairways and elevated tees. While not a huge course at 6,741 yards from the back tees, the 131 slope rating is well-earned, as your shot-making skills will be tested throughout the round, with narrow fairways demanding accuracy. If you like a longer course, The Club at Savannah Harbor will fit the bill, measuring out at 7,288 yards from the championship tees and carrying a tricky slope rating of 134. 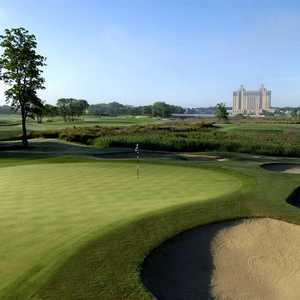 Designed by Bob Cupp in conjunction with Sam Snead, The Club is home to the PGA Tour's Champions Tour Liberty Mutual Legends of Golf Tournament. Named as one of the "Top 60 Golf Resorts in the United States" by Conde Nast Traveler, and awarded a "Four Star Best Places to Play" by Golf Digest, The Club is kept in immaculate condition, and holes No. 16 and 18 provide a panoramic view of the Historic District of Savannah. Cross Winds Golf Club has an added feature that few courses in the world can duplicate: A Combat Readiness Training Center is located nearby, to give golfers the occasional challenge of lining up a shot with an F-18 darting overhead. Head Professional Jeff Ellis said the course is in great shape, and that the 6,500-yard, 132-slope from the gold tees course appeals to golfers of all abilities. "There's a lot of different ways to play this course," Ellis said. The main course will run non-residents $44-$54 and residents $39-$47. Crosswinds also has a lighted par-3 course available, which you can get on for between $10-$15. The military course that is Hunter Golf Club. At 6,518 yards from the back tees with a slope rating of 120, Hunter is not the toughest course you'll ever play, but the flat terrain the course was built on makes it an easy walk, and several of the par 4s are as challenging as anything the private courses offer. The Bacon Golf Course offers 27 holes by Donald Ross and is a popular destination with green fees in the $40 area, though some locals have complained about an irritating lack of drainage on the course. The three nine-hole courses mix and match to make for three separate courses. The public Henderson Golf Club offers players a challenging day, with a 136 slope rating from the back tees and water comes to play on virtually every hole. With green fees from $35-41, it's well worth the investment.